If you're a Nick Drake fan, close your browser window now. If you're a more open-minded sort, why not stick around and see what happens? 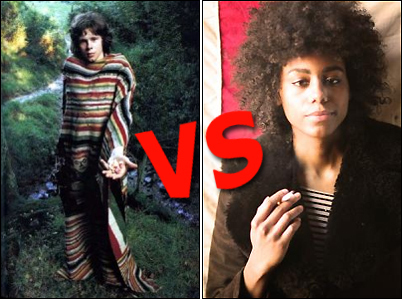 If you think Nick Drake is the guy that did What's My Name with Rihanna and then maybe probably absolutely touched her lady parts, I'm afraid this blog isn't for you (except it also kind of is). Right, enough waffle. I have been sent a cover version of Nick Drake's Pink Moon, a touchstone of the British Folk scene of the late 60s / early 70s - perhaps even the key recording of the period. Tender, haunting, exquisite, it was recorded at two consecutive midnight sessions in October 1971, shortly before Drake died of an overdose of prescribed anti-depressants. Pink Moon, and the album named after it, is a major influence on the loosely-plucked playing style of someone like REM's Peter Buck; and the lyrical imagery of artists such as Beth Orton and Laura Marling. Here's what it sounds like. The cover is by AIVA (all caps - how modern), a new solo female artist from Washington DC. She's been signed to Dirty Hit*, the label that brought you the winsome acoustic stylings of Benjamin Francis-Leftwich. And that is literally all I've been told or can find out. Her version of Pink Moon is actually very respectful. Despite the phasing synth lines and skittering drum patterns, it maintains the original's other-worldly beauty. AIVA's tenderly-layered harmonies are 100% swoonsome. You can listen below - and claim a free MP3 by clicking through to the Dirty Hit Soundcloud page. * Although her Myspace claims she's on Island Records, which suggests they're doing one of those "put out a low-key release in the summer to build up online buzz before launching her as a major-label act just in time for the Sound Of 2012 poll" campaigns. YAWN.